Kids will find it tougher to lose track of time when it's marked on the belly of their favorite animal or storybook character. We're providing three animal patterns here, but the simple plywood clock back design could be adapted to any shape you like. O The easiest way to draw the shape of the clock back onto your plywood is to begin with a full-size paper pattern and trace the shape. You can make a more durable template by gluing your paper pattern to a piece of hard-board, as we show here. 0 Choose and enlarge a grid drawing shown in the technical art, page 258, on a photocopier to produce a full-size paper pattern. © Mount the paper pattern to a piece of hardboard. We used spray mount adhesive, available at craft stores (See Photo A). You could also apply the pattern to the hardboard with a thin coat of white glue or double-sided tape. PHOTO A: Enlarge the grid drawing about 400% of its original size to create a full-size paper template for tracing the shape of the clock back. We adhered the paper pattern onto a piece of hardboard to make the template more rigid, then cut out the template shape. All grid squares are 1". 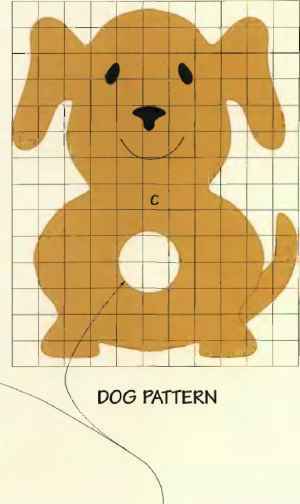 Enlarge to 400% to create a full-size pattern. Size hole for clock insert according to manufacturer's specifications. PHOTO B: Trace the template shape onto a piece of plywood, then PHOTO C: Bore a clock insert hole with a hole saw chucked In a cut out the clock back with a jig saw. drill. Support the cut from beneath with a backer board. 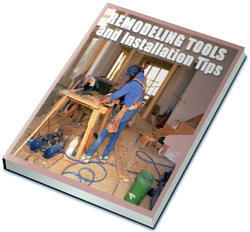 ©Cut the hard board template to shape with a jig saw, and smooth the cut edges with sandpaper. 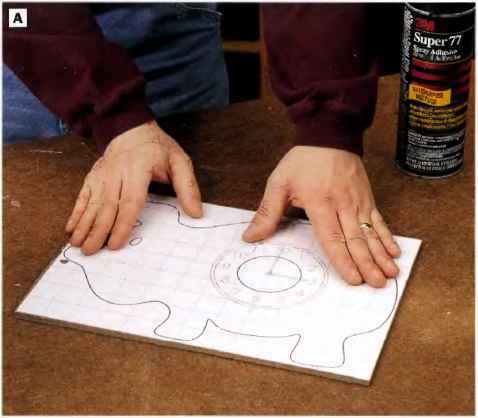 © Trace the clock back shape onto the plywood using your full-size template (See Photo B). O Cut out the clock back shaj>e witli a jig saw and fine-toothed blade. © Fill any voids in the edges of the plywood clock back with wood putty, and sand the work-piece smooth when the putty dries. © Prime and paint the clock back. Add details like eyes, nose and mouth with an artist's brush. © Cut out the clock insert hole. An easy way to do this is to first set the template in place over the clock back and drill a small pilot hole through the center of the clock pattern. 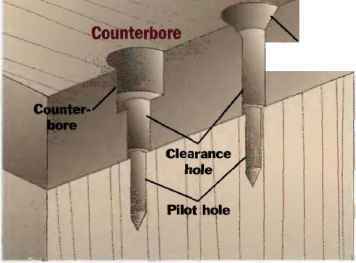 Use this as a cen-terpoint on the clock back for cut-ling the clock insert hole with a hole saw (Sec Photo C). © Install the clock insert in the clock back. Glue the insert to the clock back permanently, if you wish, with two-part epoxy. © Attach sturdy picture-hang-ing hardware to the clock back so the clock hangs evenly. 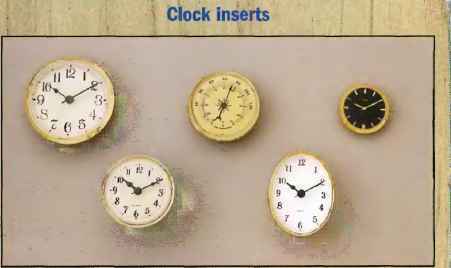 Most home centers arid woodworking supply catalogs sell an assortment of battery-powered quartz clock inserts. There also are companies that specialize in clock-making supplies, and you can And their catalogs advertised jn woodworking magazines. The style of the clock faces, hands and overall dial shapes vary widely, as do the diameters of holes you'll need to cut for Inserting them into your project, it's a good Idea to buy the clock Insert ahead of time so you can have It on hand as you plan your dock project.